This is what we had for dessert last night and they were so easy! I just followed the rice crispy treat directions on the back of the marshmallow bag (6 cups krispy cereal, 1 bag marshmallows, 3 tbsp butter/margarine). After they set up, Cut out with heart shaped cookie cutter and drizzle with chocolate. Super quick and super simple! You could make these and cut them into any shape you need. Good heavens that's cute! Those would last about a second in my home. Beautiful pictures! So adorable! 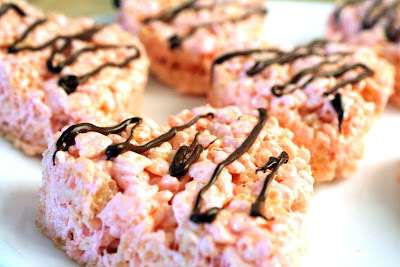 It's amazing what a difference a small change, like the strawberry marshmallows, can make! Thanks for visiting Tales From the Nursery - following back! Those look yummy! Maybe I'll try them for St. Patrick's Day. I don't know if they have green marshmallows, but I can use some green dye if they don't and I already have a 4-leaf clover cookie cutter. Cute idea. I'm following now and thanks for the comment & follow on my blog. I made these too! Your's are definitely cuter. Im your newest follower - stop by if you have a chance.